A man returns to his hometown, which he now finds is ruled by warring factions. When colonies gain their freedom from oppressive empires, all too often they fall into the opportunistic hands of those who don't have the interests of the population in mind and instead see the loose concept of 'freedom' as a get rich quick scheme. When the British and French pulled out of Africa without making any efforts to ensure the right people replaced them, many colonies fell into the hands of warlords and dictators. When the Soviet Union dissolved, Russia was quickly snapped up by anarcho-capitalist oligarchs. When Ireland gained its independence from Britain, the Catholic Church wasted no time in subjecting the nation to a similar form of oppression. US independence was quickly followed by the dual American shames of slavery and Native genocide. The list goes on. 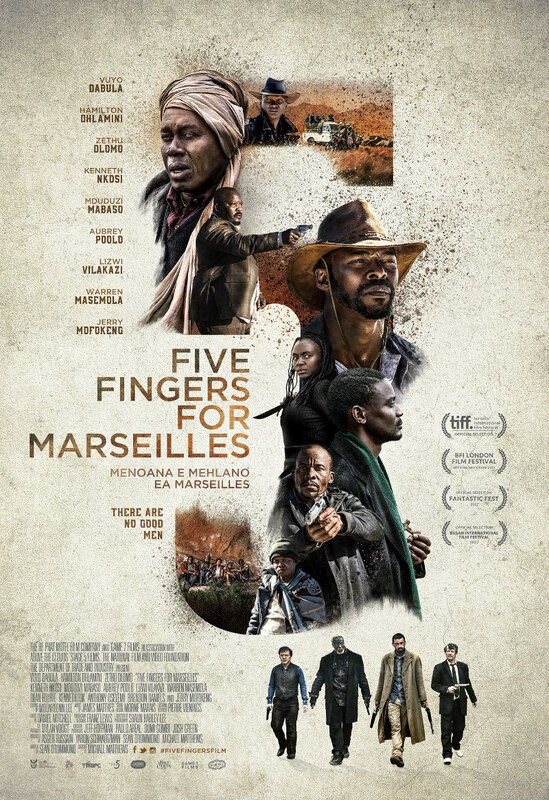 With Five Fingers for Marseilles, director Michael Matthews uses the microcosm of a small town in an alternate reality version of South Africa - a curious mix of 1895 and 1985 - to explore the dangers of post-colonial opportunism. Marseilles is a small colonial town inhabited by whites who have moved the native black population to a nearby shantytown known as 'Railway'. The Five Fingers of the title are a group of kids with dreams of resisting their white oppressors - think a third world Amblin gang. One day when a posse of corrupt white cops arrive in Railway and abduct Lerato, the sole female member of the Five Fingers, violence erupts, with gang member Tau killing two cops and subsequently fleeing his home. 20 years later, Tau (Vuyo Dabula) returns to his homeland. Apartheid has now ended and Marseilles has been returned to its original black inhabitants. All is far from peaceful however, as the town finds itself torn between two rival factions. Tau's childhood friend Bongani (Kenneth Nkosi) is now the corrupt mayor, with the police in his pockets, while on the outskirts of the town, glass-eyed mobster Sepoko (Hamilton Dhlamini) leads a gang of thugs with the intention of taking over the town for himself. What follows is a tale as old as cinema, with Tau swearing himself away from a life of violence until he reaches the point where he is forced to draw his pistol once more. The movies of Sergio Leone are a clear influence on Matthews and his screenwriter Sean Drummond, with a central dynamic straight out of A Fistful of Dollars and the film climaxing (and ominously opening) in a Mexican standoff. Tau may not be a man with no name (though technically, neither was Leone's), but he's the classic quiet western antihero, almost as silent as the mute hero of Sergio Corbucci's The Great Silence. 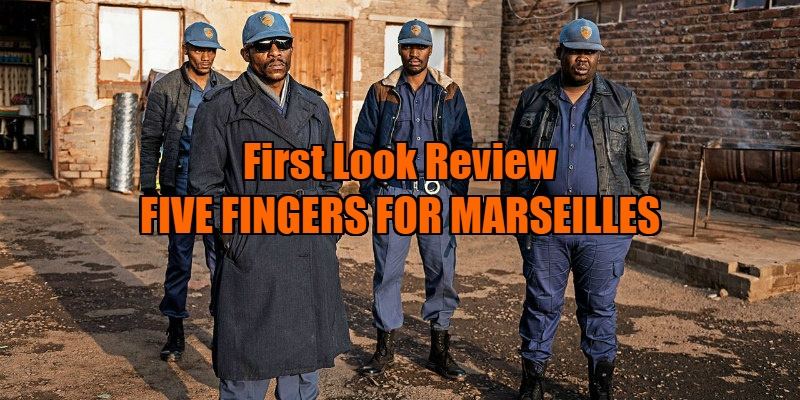 The aesthetic of Five Fingers for Marseilles pulls as much from the Australian 'Ozploitation' movies of the '70s and '80s as from the spaghetti westerns of the '60s. The images of characters driving battered yet tricked out '70s cars through an arid landscape recalls Mad Max, and the criminally administered town of Marseilles isn't a million miles away from the setting of Dead End Drive-In, a reminder that we're watching a Southern Hemisphere take on American genre cinema. 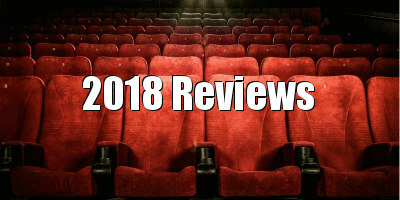 2018 has seen the western, that most American of genres, successfully appropriated by a variety of disparate cultures - Ireland (Black 47); Indonesia (Marlina the Murderer in Four Acts); Australia (Sweet Country) - but unlike those examples, which all managed to mould the tropes and iconography of the genre into their specific milieus, Five Fingers for Marseilles simply resembles a western played out in a location and language previously alien to the genre. Despite its post-colonial allegory, Matthews' film is as generic a western as any to emerge in the mid 20th century heyday of the genre, though with its often ponderous nature and extended running time, it may test the patience of even the most obsessive western fans.